The Dillyboys, The Rushes, at the Taproom! 10-11pm The Rushes have a propulsive, energetic sound, drawing influences from folk/rock, jazz and pop. 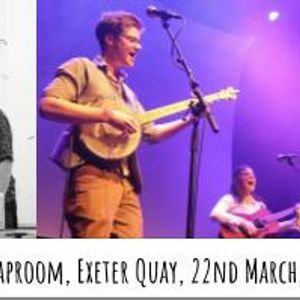 A prolific live outfit, they have hopelessly worked the Exeter gig circuit for almost 4 years, and can often be found busking on the High Street. Available for gigs and functions. They don’t like Tony Blair, but they sure as hell love tearing up the stage wherever they go. 8.30-9.30pmThe Dillyboys are an energetic folk band, bringing to life original and traditional songs and tunes, using guitars, banjo, accordion, mandolin, and carefully constructed harmonies. Their debut EP is a fine example of a sound they have coined ‘Shanty Chic.’ They have cultivated a reputation for lively, rambunctious concerts that have a strong focus on audience participation.